Lightning bolts have "unexpectedly" been discovered arcing through the atmosphere of Venus. 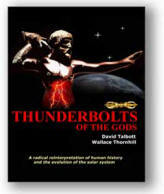 Electric Universe advocates predicted such activity long ago. A recent announcement by the European Space Agency (ESA) has called attention to the "surprising" electrical activity taking place on the planet Venus. Electric discharges were detected in the planet's upper atmosphere by the Venus Express orbiter that has been circling the cloud-shrouded orb since April 11, 2006. The discovery was completely unexpected because, until now, the density of the Venusian atmosphere was thought to prevent the formation of lightning bolts. "If lightning exists in the Venusian atmosphere, it is either extremely rare, or very different from terrestrial lightning. If terrestrial-like lightning were occurring in the atmosphere of Venus within the region viewed by Cassini, it would have been easily detectable." The Cassini spacecraft circled Venus on its way to explore the Saturnian system. In order to save fuel, NASA engineers sent Cassini on a trajectory that flew it twice around Venus so that it could receive a "gravity assist" from the planet. During those flybys, Cassini monitored the cloud tops and found no evidence that Earth-like lightning was taking place. Now, Venus Express has found low-frequency EMR that appears in bursts lasting fractions of a second. Called "whistlers", the bursts are considered a sure sign of electric discharges. A whistler is an extremely low-frequency electro-acoustic wave that is normally generated by lightning. They are called "whistlers" because they demonstrate a characteristically decreasing frequency falloff in detection equipment. In some short-wave radio transmissions, the whistle can be heard while tuning between stations. "We consider this to be the first definitive evidence of abundant lightning on Venus," said David Grinspoon from the Denver Museum of Nature and Science. In a previous Thunderbolts Picture of the Day, we noted that the optical spectrum of Venus resembles that of a gas discharge tube similar to a neon lamp. Astrophysicists are unable to explain the contradictions that inevitably result when trying to explain the data based on greenhouses and smog, but the electrical explanation covers all the bases. Indeed, the atmospheric composition of Venus seems to require the presence of intense lightning in order to form the sulfurous compounds that are present. No chemistry on Earth or Venus can explain the depth and density of the sulfuric acid clouds and abundant carbon dioxide. Venus radiates in the infrared with twice the energy it receives from the sun, so there must be a source for that heat. Venus has an extremely weak magnetic field and no magnetosphere but it does possess an ionosphere, so it is an electrically charged body. The ionosphere is prickly with Birkeland currents that carry electricity from the "solar wind" (actually a stream of ions ejected by the sun's electromagnetic field) into the Venusian environment. With so much electrical energy pumping into it, it may be that the planet is constantly charging and discharging with an infrared glow. Birkeland currents act as transmission lines moving energy from the sun and planets over the entire solar system and ultimately, throughout interstellar space. Venus is not really separate from the sun, but acts as an element in the vast electrical circuit that powers the stars. Plasma discharges in that scenario are not so "unexpected". In the image at the top of the page, many examples of electric discharge machining can be seen. 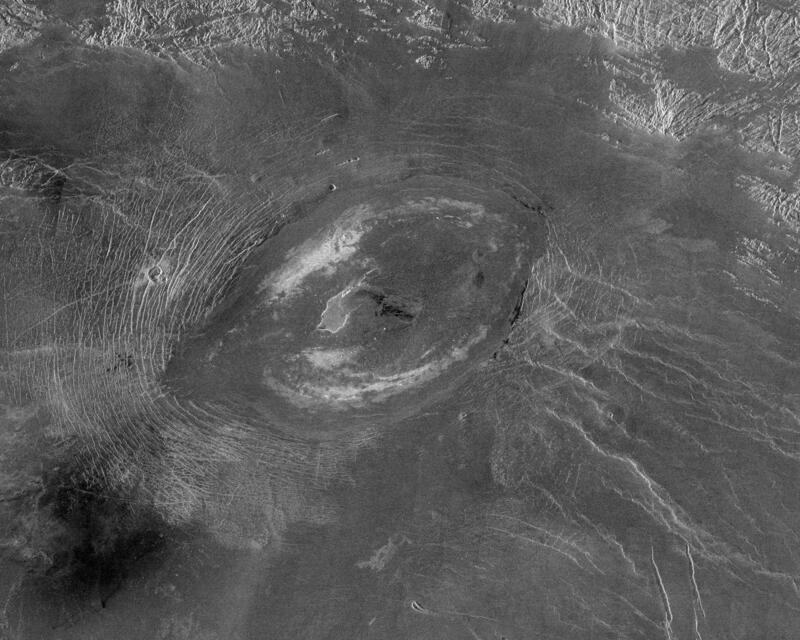 The crater rim is elongated and clearly shows the marks of multiple rings. There are sinuous rilles in the surrounding terrain much like those on Mars, the Moon, Europa and other celestial bodies. We have theorized many times in these pages that such formations are the result of tremendous lightning bolts that seared them into the surface like a plasma torch. Because of the observational data and the ideas put forth by such luminaries as Langmuir and Alfven, lightning on Venus was both expected and predicted by Electric Universe theorists.